Bamboo: The very word evokes an image of groves of tall, leafy plants swaying gently through the air while Buddhist monks practice Tai Chi and Kung Fu, and pandas munch peacefully. While this may not exactly be a common scene in North America, bamboo is a surprisingly easy plant to propagate here (depending on your region). It has an even more surprising number of uses: garden trellises, fencing, screens and hedges, musical instruments, paper, bicycle frames, furniture, shelter, land conservation, home décor, and fuel. With a little creativity, there are many bamboo uses for the homesteader and casual grower. The author's wife, Jenna, plans on creating a bamboo roof for squash to climb on. Running bamboo sends out rhizomes below the surface. Each node can produce a new bamboo shoot. Use a spade to cut runners and dig up root balls. Cut bamboo canes as close as possible to the ground. 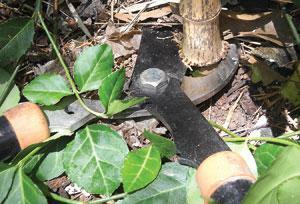 Use a quality hand saw to trim bamboo canes. 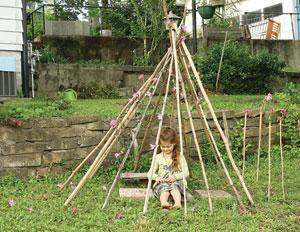 The author's daughter, Sadie, works on a project in a bamboo tipi built by the Sears' kids as a Mother's Day gift. 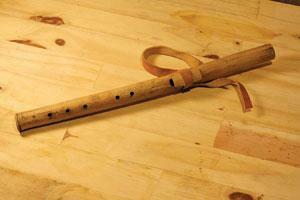 A flute handmade from river cane, a type of bamboo, by the author (but mostly by his friend Barbara Graham). 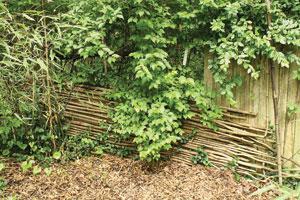 Bamboo canes can be used to fill in gaps in fences. 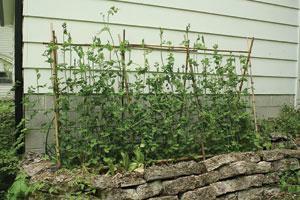 A pea trellis at a neighbor's house. The author uses bamboo canes in his tomato and pepper garden. Extra bamboo can be placed around each pole to make bamboo tomato cages. Bamboo shoots usually start appearing in late spring. They grow very quickly and many species are edible when young and tender. Unless you're like me and were lucky enough to move onto land with a well-established grove, you'll need to find a source for bamboo starts. Your first step should be to ask around. When you find someone with bamboo, their likely response will be "Yes, please take as much as you want! I can't keep this stuff from spreading!" Unless you want to end up like your flustered neighbor, you'll need to take some precautions before planting your own. In a properly planned and cared-for grove, you'll have more than enough bamboo to work with, but won't have to constantly worry about keeping it in check. The reason bamboo has a reputation for spreading is because it is a rhizome-based plant. Try to dig up one bamboo plant and you'll find that just a couple of inches under the dirt it is connected by a root system to several other plants. Not all varieties spread quickly, though. Clumping bamboo (Fargesia) has rhizomes but they don't spread horizontally like running varieties and grow much slower. There are many varieties and each has its own unique characteristics. For the homesteader's purposes the decision really comes down to two options: clumping bamboo or running bamboo. Your highest rate of success in having bamboo to harvest within a single growing season is to purchase a variety from a nursery that is known to grow well in your region. But if you decide to dig up a clump from a neighbor, you are stuck with that type of bamboo. It may take a season or two for your grove to establish itself by this method, though. Before even considering procuring bamboo starts, determine your needs and plan your grove accordingly. Is the variety you're interested in shade-tolerant or does it prefer a good bit of sun? If you're not buying from a nursery, take note of the location of your neighbor's grove. Regardless of the variety, most bamboo needs at least five hours of direct sunlight. It will need plenty of water, fertilizer, and light shade at first, but less so as it grows. If you have the space and would like to have a large grove from which to harvest, plan to plant it in a field or in a shady forested area. Consider also that bamboo is great for preventing soil erosion and providing shady microclimates for farm animals and wildlife. If planning on transplanting running bamboo in an area where you don't want it to spread far, such as along a neighbor's fence, you're in for a chore. The safest way to do this is to dig a trench as long as you want your bamboo fence to be (at least a foot away from your neighbor's fence). Next, dig a 28-inch-deep trench and place some 30-inch 60-mil high-density polyethylene plastic along the edge of the trench where you don't want it to spread. When filling the trench, pack the soil tightly, as loose soil or air pockets will give the roots an opportunity to turn downwards. 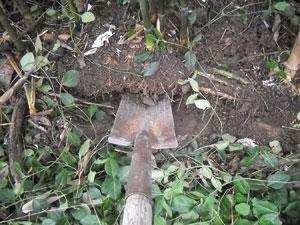 Finally, after transplanting, dig a 12-inch-deep trench in front of the bamboo to keep it from spreading outward. You may still need to cut off some runners, ideally in late fall, but this trench will help keep them in check. When you're ready to get some running bamboo for transplanting, keep in mind that you'll need to dig it either very early in the spring or late in the autumn. You may have some luck if you plant it in mid-to-late spring while it is shooting, but it's best not to. Never transplant it in summer during its active growth period. Start by digging around the base of a cluster of three to five bamboo culms (stems) and chop at the roots until you can dig up a root ball. It will come up easily once you've removed the connection to the rest of the runners. It is critical to keep the rhizomes wet until transplanting, as they can dry out very quickly. Place them in a large, transportable bucket or tub with enough water to cover the root ball or wrap them in a wet blanket or burlap sack and plan on transplanting them as soon as possible. Once you're ready to plant, think about how you would like to arrange them. If you have more than one root ball, place them three to five feet apart to create a dense cluster. If you would prefer a less dense grove, plant them as much as 15-20 feet apart. Start by digging a shallow hole in which to place the root ball and place some compost in the hole. Take care to not dig too deep. If you dug it up yourself, you should have noted how close to the surface the roots were. Place the clump in a similar manner and spread dirt around it. If you're worried about wind knocking it over, stake it down. Next, dig a dam just below the root clump to catch rainwater if on a slope, or around it if on flat ground. Check it regularly, particularly after hard rains, to ensure water is being retained. Bamboo is a forest plant and, left to itself, will generally do just fine. If you haven't planted it in a grove of trees, you will want to emulate the forest floor by placing some mulch around the roots and rhizomes once or twice a year. Leave any fallen leaves under the plants, as they will help enrich the soil. 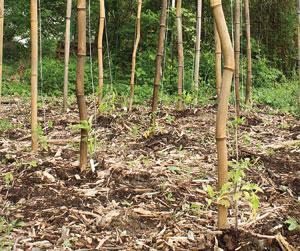 Bamboo prefers moderately acidic loamy soil, but any well-maintained soil should do fine. Apply a high-nitrogen fertilizer a couple of times a year to keep the grove super healthy. When you've got a healthy grove, the fun begins! My family shares a grove with a neighbor, Robert Sears, who lives with his family in his childhood home. He planted some bamboo in a forested area between our houses as a child and it has since grown into a healthy forest that stays where we want it. Every year, we harvest bamboo for all sorts of purposes. We've learned that the grove stays healthier and produces more shoots each spring if we regularly thin it. It's best to thin in late fall, but I've done it all times of the year and our grove stays plenty healthy. For bamboo you will be using for a project, look for canes that have turned light tan. Between three and six years old is ideal, but if you haven't been paying close attention to how long each new shoot has been growing, you'll just have to make your best guess. Try to harvest when you've had a prolonged period of dry weather for optimal curing. 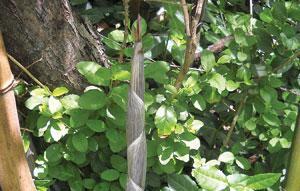 To cure, place the canes in a well-ventilated, covered, and shaded area and let them sit for a few weeks. Curing is only necessary if you plan on using them long-term, such as for craft projects. 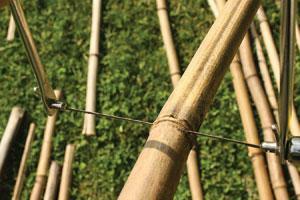 Bamboo used for garden projects may split over time but will remain sturdy for several years. Take care when cutting bamboo canes to do it properly. Do not just go at them with a machete. I've found the best method is to take a tree lopper or pruner and cut them as close to the ground as possible. This will ensure a solid cut and prevent potential injuries from a poorly cut cane. Bamboo has a reputation for having been used as a torture instrument for a reason. Splinters tend to be very thin and sharp and can cause a deep cut with barely a touch. Wear gloves while handling newly-cut canes. When I need to do some serious culling, I go at it with a chainsaw. Once you've lopped down as many as you can handle, the next step is to cut off the many leafy stalks protruding throughout the length of the bamboo. I've found the easiest way to do this is with a hand lopper or quality gardening shears. When I get near the very thin top portion I usually just cut the end off with stalks intact. These make great fire starter and can really flame up a backyard fire pit. Be ready for random loud pops from the portions of the cane that are hollow and have pent up air inside. I usually set aside any splintered bamboo as well. They make great kindling but burn quickly. Depending on your project, you may want to cut off a couple of lengths from each stalk. I usually take the thick bottom end and cut about five or six feet for tomato and pepper stakes. Don't use a lopper for the thick portions or the cane may splinter. I've found it's best to take a quality hand saw and saw them off at the seam. I then take the bottom end (which I sometimes cut at an angle), place it in some soft dirt, hold the top end as close as possible to the top to prevent splintering, and start pounding away with a rock. Generally a good six inches in the ground is enough to hold up even the heaviest of tomato and pepper plants. 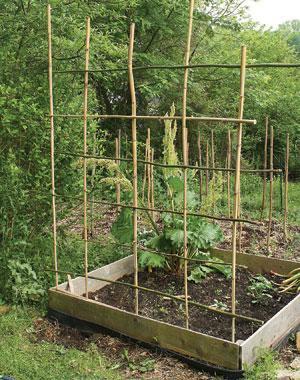 You can also take some of the smaller ends and stack them around the stake in a tipi to form a tomato cage. I've found that this also works well for growing climbing beans and peas. With a bit of creativity, you can have all kinds of fun in the garden. My wife is currently working on a roofed trellis that she will use to grow climbing squash and the kids have even come up with their own construction projects with excess bamboo. Really, the only limit to bamboo uses is your imagination. My wife has used it for decorative projects in the house and I've even made a flute out of Arundinaria bamboo, also known as river cane or switchcane. Granted, most of the work was done by my friend Barbara Graham of Blackfeather Wood Works in Irvine, Kentucky, and I have no idea how to play it properly, but it's a fine piece of handiwork, if I say so myself. Grow some bamboo (carefully) and just watch the possibilities open up! Jereme Zimmerman lives in Berea, Kentucky. He writes on modern homesteading, homebrewing, fermentation, and good eating as RedHeadedYeti at Earthineer.com. Visit www.jereme-zimmerman.com for information on his writings and event schedule. He is the author of Make Mead Like a Viking.